Last week, education minister Nick Gibb came unstuck after he tried to answer a grammar question for 11-year-olds. The schools minister was asked on BBC Radio 4’s World at One whether the word “after” was a preposition or a subordinating conjunction, and despite answering confidently, got it wrong. But Mr Gibb should take heart that he is definitely not alone when it comes to politicians failing to answer questions aimed at primary school pupils. 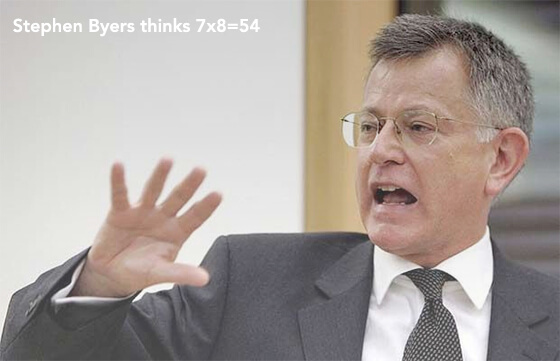 Back in 1998, the then Labour schools minister Stephen Byers, tasked with raising standards in schools, was asked what seven times eight was live on BBC 5Live. He answered: “54”, making him an overnight laughing stock. But Mr Gibb and Mr Byers have nothing on good ol’ Dan Quayle, the former US vice president. The man who held the second highest office in the free world was on the campaign trail fighting for re-election with George Bush Snr when he corrected a student’s spelling of the word “potato” with “potatoe”. They lost the election. Perhaps Mr Gibb should have taken a leaf out of his boss – Nicky Morgan’s – book. The education secretary flatly refused to answer what 11 times 12 was live on BBC Breakfast for fearing of making herself look silly – successfully making herself look silly in the process. She must have learned from her Conservative colleague Chancellor George Osborne, who was asked (by an 11-year-old, no less) what seven times eight was. The man in charge of the government’s finances was having none of it, however. When presented with the question, he simply declared that he had made it a “rule in life” not to answer maths questions. It is not just basic maths which catches politicians out – Sports Minister Helen Grant could not get a single right answer when she faced a series of on-air questions about football, rugby, tennis and the Paralympics. And David Cameron could not come up with the answer to one of the most basic question of all – what is the price of a loaf of bread – having to fall back on the excuse that he made his own using an electronic bread-maker. Prime Minister David Cameron later ducked a maths challenge when answering questions following a speech in north London. Asked by 5 News political editor Andy Bell to calculate nine times eight, Mr Cameron responded: “I’m going to plead the Nicky Morgan defence, which is I do times tables only in the car with my children on the way to school.